Ah, the dualities of life are so poignant right now. First, the excitement of a new man in my life. Then, the other end of the emotional continuum, finding out that Miss Roxy has cancer. Duality. Joy and sadness, praise and blame, gain and loss, light and dark. We gather for Teacher Training again this weekend. It is one of the long weekends (16 1/2 hours of teaching in three days). I need to gather myself and focus on these bright beings journeying through some of their own dark places. These past two weeks the trainees have been learning about Saucha, the first Niyama or observance, which translates from Sanskrit as cleanliness, purity, light, illumination. When I look over the last two weeks and all that has happened, I am struck by the presence of Saucha. The way the heart is striped, purified down to the essentials in times of intense joy or pain. What is truly important in life becomes clear very quickly—a “cleaning” of priorities. The light itself is changing as well. Rising later, setting earlier. The angle and tones of the sun are softer. In celebration of Saucha, here are some photos from the last couple of weeks. Humble moments of purity and illumination. Life coming through in the light. 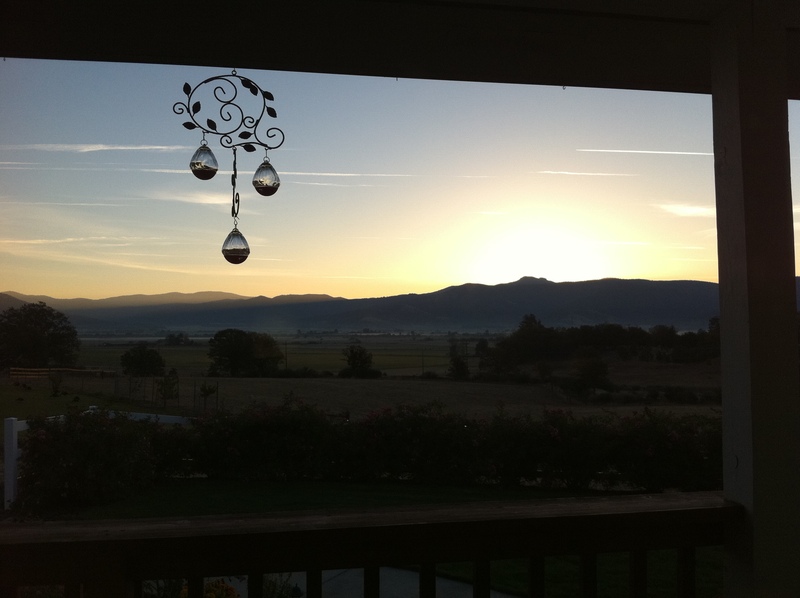 Sunrise from my dad’s porch in (true) Northern California. I sure miss seeing the start of a simple day on the horizon. 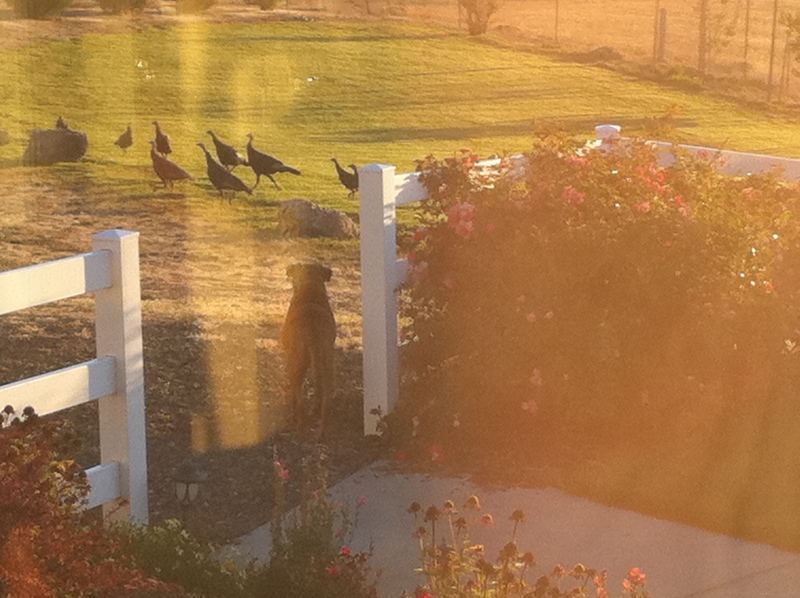 Also at my dad’s: Roxy trying to figure out what those birds are. And whether it would be worth the energy to chase them. I took this through the window and the yellow-orange light, along with the hint of a reflection of the inside of the house, carries some emotion for me. This was a “mistake.” Cowboy was walking in a circle around me and I couldn’t get his whole body, in the proportion I wanted, in the frame. He looks a little misshapen because he was in motion and I caught him in step. But I love the light rays. Are they coming toward us or from us back to the sun? There was a photo shoot at the studio few weeks ago. I’ve taken many yoga photos with this photographer in our studio space and I’m always amazed at the beautiful light it holds*. The reflections off the floor, the way the curtains dissolve into haze. It’s a very special place. *Moment of shameless horn blowing: To see some of said pictures, check the first frame here, or the cover of the current PrAna catalog, or pages 66-69 in the November issue of Yoga Journal. That’s me! Super fun. Cowboy and I went on our first ride yesterday. Very exciting. 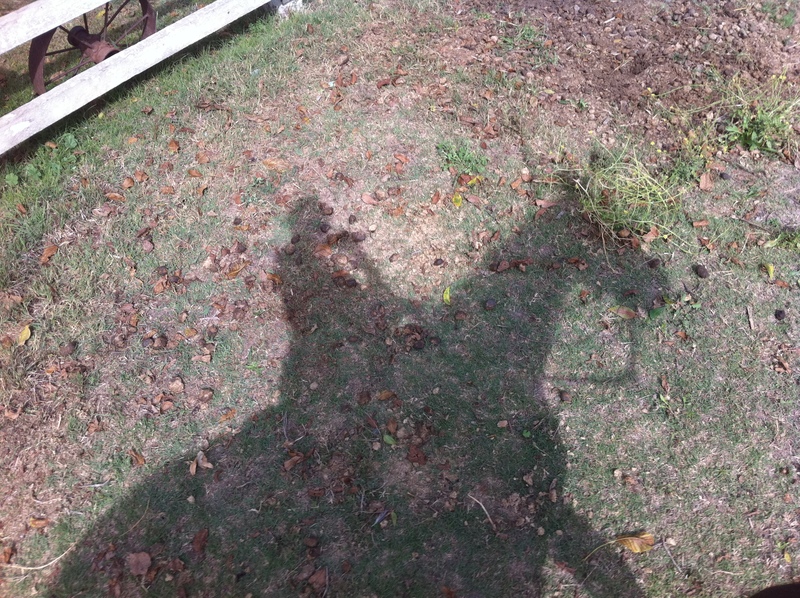 It’s been a long time since I saddled a horse. 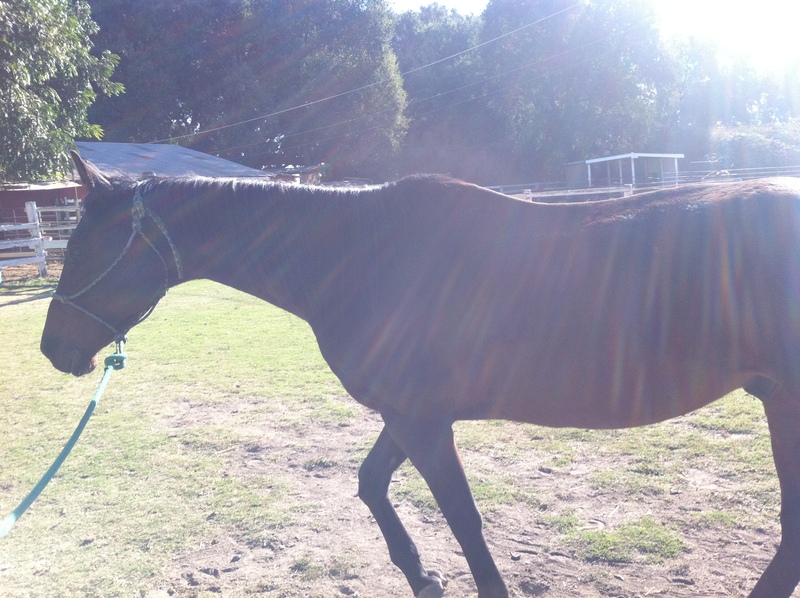 We just rode around the enclosed pasture at R&R, but it was sheer bliss. The sky was mostly gray, but the sun peeked through for a few minutes and I was able to see myself in our shadow. Thanks to the light. This last one is of Cowboy and I going for a walk. 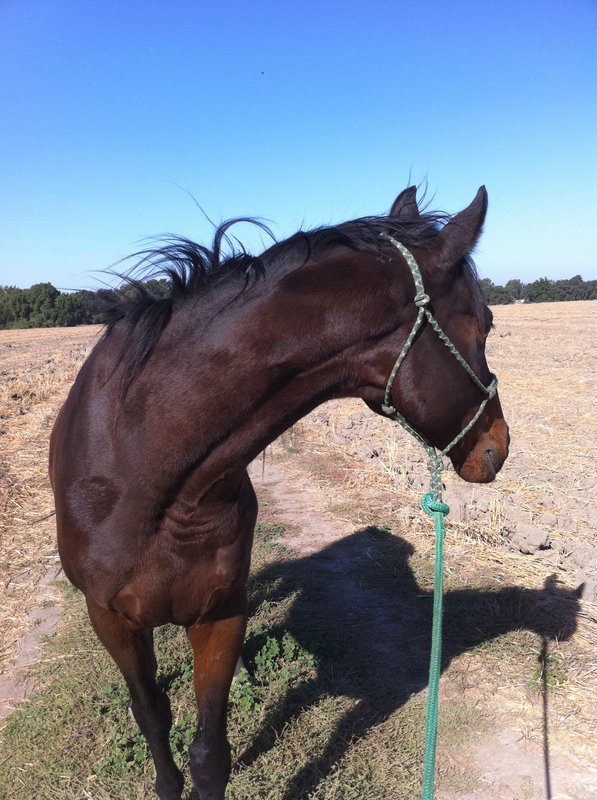 I love the shadow, the clearness of the sky, the light on his neck as he turns, his mane in the wind. I don’t know what he was looking at, but what I said to him was, There’s no going back, Cowboy. There’s no going back now. Any moments of clarity or illumination in your life? How do adjust to the changing light? I feel like so much of my life is lived in duality right now. The pain of watching a friend lose her dad; the joy in knowing that I get to support my friend and see some of my favorite people in celebration of his life. The sadness in not feeling fulfilled at work, but the clarity of knowing what my passion really is. The shifting in relationships. It’s all present, all the time. It’s just learning to live in both. Love this post. Our trip to Zion, Bryce, and the Grand Canyon last week had me pondering Saucha several times. The huge sky, cool and clean air, nature on a grand scale were all purifying, embracing, and soothing. It was a reminder of how little we are and how big we are, of how insignificant we are and how vitally important we are. All at the same time. Duality. Ebb and flow. Cleansed with each pulse. Beautiful post, Michelle, thank you. I saw that PrAna photo. Wow, just wow. This has been a month or two of huge epiphanies, which give me those moments of clarity and illumination. I am learning how to adjust because generally when they arrive, I have no idea what to do with them. It seems to take time for them to settle so I can find small steps to take. @amy – hug. love you, girl. @bob – ‘how little and big we are, how insignificant and important’… isn’t is true. thank you. @elizabeth – wow – a two epiphany month!? kudos on relaxing around their arrival.